A reader pointed out to me that LEAP's monthly newsletter should also get posted to the blog. He's absolutely right. Please enjoy our September issue below. You can sign up here to receive the newsletter by email. The walls are beginning to crumble. In recent weeks, Argentina, Colombia and Mexico have all taken steps to decriminalize drug possession and treat drug abuse as a health issue, not a legal problem. In August, Mexico decriminalized the "personal use" of drugs including marijuana, cocaine, heroin and methamphetamine. Those caught with amounts under the designated limit will be encouraged to seek treatment, with treatment mandatory only for those caught three times. Five days later, Argentina's Supreme Court decriminalized the possession of marijuana intended for personal consumption, and this month, the Colombian Supreme Court also ruled that possession of illegal drugs for personal use should not be treated as a criminal offense. These new policies attempt to distinguish between drug users and violent traffickers. But while it is certainly a step in the right direction to treat drug addiction with rehabilitation rather than incarceration, decriminalization efforts do little to stop the violent crime resulting from the War on Drugs. The cartels can only be eradicated through legalization. LEAP speakers Maria Lucia Karam and Walter McKay spoke to the U.K.'s The Guardian, and Judge Karam clearly articulates that while she welcomes the move toward decriminalization, "Unfortunately the 'war on drugs' mentality is still the dominant policy approach in Latin America. The only way to reduce violence in Mexico, Brazil or anywhere else is to legalize the production, supply and consumption of all drugs." Here are just a few of the issues our speakers addressed in August. We hope you'll share "Dispatches from the Front Line…" with a friend. We've heard a lot about the terrible death toll Mexico has suffered during the drug war - over 11,000 souls so far. This helps to account for the startling lack of controversy that greeted last week's news that Mexico had suddenly decriminalized drugs - not just marijuana but also cocaine, LSD, and heroin. In place of the outrage and threats that U.S. officials expressed when Mexico tried to decriminalize in 2006 was a mild statement, from our new drug czar, that we are going to take a "wait and see" approach. Still, we've heard nothing about the American death toll. Isn't that strange? So far as I can tell, nobody has even tried to come up with a number. Until now. I've done some rough math, and this is what I found: 6,487. Your articles about drug war failures were most refreshing. However, as a cop on the front lines for 34 years, I take issue with your editorial claim that a "fact-based drug policy...would likely leave in place the prohibition on 'hard' drugs." 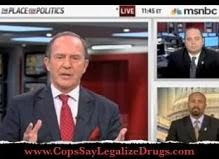 Until we legalize and effectively regulate all drugs, criminals will continue to gun down rival traffickers, police officers, and innocent bystanders. And as long as we incarcerate so many people on possession charges, we won't have enough resources to tackle substance abuse. Norm Stamper will be on the road quite a bit this fall, with tours planned in San Francisco in September and Australia in October. For more information on upcoming LEAP presentations, please see our events calendar. How do you stop the international drug cartels? LEAP Executive Director Jack Cole presented our answer - legalization - in Cambridge, England at the 21st International Symposium on Economic Crime in early September, which boasted nearly a thousand attendees from 90 countries. During his visit to the United Kingdom, Jack also visited TRANSFORM: Drug Policy Foundation, LEAP's sister organization. TRANSFORM is preparing to release After the War on Drugs: Blueprint for a Regulated Market, the final book in its trilogy, in November 2009. As recent decriminalization laws from abroad make news, LEAP continues to expand our already substantial international presence. During his trip, Jack met with several of our speakers and volunteers from England, the Netherlands, and Germany and received invitations to speak from five countries, including Brazil and Japan. Our speakers also made a splash domestically this past month. Russ Jones, a former narcotics detective, toured California, making more than a dozen presentations, signing up new members and educating people about the need for change in drug policy. Retired police captain and LEAP co-founder Peter Christ appeared on radio shows from Lakeport, California to El Paso, Texas to Chicago, IL, and covered plenty of ground in between. Jack Cole and active duty Canadian beat cop David Bratzer attended the Netroots Nation Conference in Pittsburg, where they recruited new members and strategized the role of technology with progressive voices from all over the country. Undercover Baltimore police officer Dante Arthur was doing what he does well, arresting drug dealers, when he approached a group in January. What he didn't know was that one of suspects knew from a previous arrest that Arthur was police. Arthur was shot twice in the face. In the gunfight that ensued, Arthur's partner returned fire and shot one of the suspects, three of whom were later arrested. To continue reading Moskos and Franklin's Washington Post Op-Ed, please click here. To view their interview on MSNBC, please click here. Please join LEAP at the 2009 International Drug Policy Reform Conference November 12-14. Correction: In the August issue of Dispatches from the Front Line... we erroneously referred to Joseph Brooks as Deputy Chief, when in fact his rank was Senior Captain. We apologize for the error. All of this work happens because of generous donations from our supporters. Your gift to LEAP is tax-deductible. Donate now to show your commitment to ending the War on Drugs.